Home computer term What are HTTP, HTML, URL, WWW, FTP and DOMAIN? What are HTTP, HTML, URL, WWW, FTP and DOMAIN? Hypertext Transfer Protocol (HTTP) is an application layer network protocol used for distributed information systems, collaborative, and using hypermedia. Its use in making a lot of resources that are connected by links, called hypertext documents, which later formed the World Wide Web (WWW) in 1990 by the British physicist, Tim Berners-Lee. Until now, there are two major versions of the HTTP protocol, the HTTP / 1.0 which uses a separate connection for each document, and HTTP / 1.1 are able to use the same connection to perform the transaction. Thus, HTTP / 1.1 may be faster because it does not have to waste time for the making repeated connections. HyperText Markup Language (HTML) is a markup language used to create a web page, displays a variety of information on the Internet and a web crawler written formating simple hypertext format file into ASCII (American Standard Code for Information Interchange) in order to produce a display form the terintegerasi. In other words, a file created in a word processing software and stored into normal ASCII format so that it becomes the home page with HTML commands. HTML is a widely used standard for displaying web pages. HTML is now an Internet standard defined and controlled use by the World Wide Web Consortium (W3C). HTML created by TEAM Caillau collaboration with Berners-Lee Robert when they are working at CERN in 1989 (CERN is a high-energy physics research institute in Geneva). 1. Absolute URL (absolute URL), is a complete tool which includes a domain on the right network, in the domain directory, and the files in the directory. 2. Relative URL (URL Relative), specify a URL based on the current address at the time. Waring Wera Wanua or the World Wide Web (abbreviated as WWW or Web) is an information space that is used by global identifiers called Uniform Resource Identifiers (URIs) to identify the sources - a useful resource. WWW is often considered synonymous with the Internet as a whole, even though he is only a part thereof. WWW (World Wide Web), is a collection of web servers around the world that serve to provide data and information to be used together. WWW or so-called Web is the most interesting part of the Internet. Through the web, you can access information that is not only text but can also include images, sound, video and animation. WWW is a program invented by Tim Berners-Lee in 1991 Originally Berners-Lee just wants to find a way to arrange the archives - archival research. To that end, he developed a system for personal use. The system is a software program which is named Equire. With the program, Berners-Lee succeeded in creating a linked network between the various archives so as to facilitate the needed information. This then becomes the basis of a revolution known as the Web. WWW was first developed at the Research Center of the European Particle Physics (CERN), Geneva, Switzerland. In 1989 Berners-Lee made ​​a proposal for a global hypertext project-making, then in October 1990, 'World Wide Web' was able to run the CERN environment. 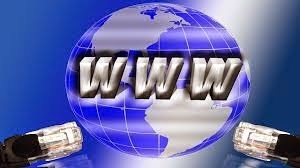 In the summer of 1991, official WWW is used widely on the Internet. File Transfer Protocol (FTP) is an Internet protocol that runs in the application layer which is a standard for transferring files (files) between your computer machines in an internetwork. FTP is one of the earliest Internet protocols developed, and is still used today to perform the download "Download" and "Upload" computer files between the FTP client and FTP server. An FTP client is an application that can issue FTP commands to an FTP server, while Server FTP is a Windows Service or a daemon that runs on a computer that responds to commands from an FTP client. Commands - FTP command can be used to change the directory, change the mode of transfer between binary and ASCII, evocative computer files to an FTP server, and download files from an FTP server. Domain Name System (DNS) is a system that stores information about the host name or domain name in the form of databases scattered (distributed databases) in a computer network, eg the Internet. DNS provides the IP address for each host name, and lists the mail transmission server (mail exchange server) that receives e-mail (e-mail) for each domain. DNS provides important services to the Internet, when computer and network hardware work with IP addresses to perform tasks such as addressing and routing (routing), humans generally prefer to use a host name and domain name, for example, is the designation of a universal source (URL ) and email address. Common analogy used to describe its function is the DNS can be considered as an internet phone book where when users type in a web browser www.google.com then the user will be redirected to the IP address 8.8.8.8 (IPv4), and 2001: E00: d: 10 : 3: 140 :: 83 (IPv6). Paul Mockapetris invented the DNS in 1983, the original specifications appear in RFC 882 and 883. In 1987, the publication of RFC 1034 and RFC 1035 updated the DNS specifications. This makes RFC 882 and RFC 883 does not apply anymore. Some recent RFCs have some additional Promote the core DNS protocols. What is a Domain or Domain Name? Domain or Domain Name (Domain Name) is given a unique name to identify the name of the server computer as a web server or mail server on the computer network or the Internet. The domain name serves to facilitate the users on the Internet at the time of access to the server, and also used to remember the name of the server that you visit without having to know complicated series of numbers known as an IP address. This domain name is also known as an integral part of a website such as for example "facebook.com". The domain name is also sometimes referred to as a URL, or website address. At first only the domain name can be written with the Latin alphabet to the 26th, but this time it has been possible to use foreign alphabet with internationalization of domain names. Domain name system (DNS) is a system of rules that is used in the naming of the domain name in.